Gallup poll has found that Americans' sympathies lean heavily toward the Israelis over PA Arabs. Ahead of U.S. President Barack Obama’s to visit Israel, a Gallup poll released on the weekend has found that Americans' sympathies lean heavily toward the Israelis over Palestinian Authority Arabs, 64% vs. 12%. In fact, the poll found, the 64% ties the highest Gallup has recorded in a quarter century, last seen in 1991 during the Gulf War. At that time, 7%, sympathized more with PA Arabs. One of the more notable aspects of the trend is the steady increase in relative support for Israel over the past decade, at the same time that the percentage with no opinion or favoring neither side has declined. Preference for PA Arabs has been relatively flat, generally in the mid-to high teens, Gallup has found. Consistent with prior years, Republicans are substantially more likely than Democrats to favor the Israelis, 78% vs. 55%, the poll found. Support for Israel has increased among all Republicans, Democrats and independents since 2001, but particularly among Republicans and independents. The percentage sympathizing more with the Israelis has increased by 18 percentage points among Republicans (from 60% to 78%) and by 21 points among independents (from 42% to 63%). By comparison, Democrats' support has increased four points (from 51% to 55%), according to the poll. Republicans' sympathy with Israel spiked to 77% in February 2003, likely associated with the run-up to the Iraq war, when Israel supported U.S. aspirations to remove Saddam Hussein from power. It sank sharply in a subsequent poll in May, but then returned to the high 60s in 2004. Older Americans are more likely to support Israel, the poll found, with sympathy rising from 55% among 18- to 34-year-olds to 65% among 35- to 54-year-olds, and to 71% among those 55 and older. However, the diminished support among younger adults reflects higher proportions with no opinion or saying they favor neither side. Twelve percent of each age group favors PA Arabs. 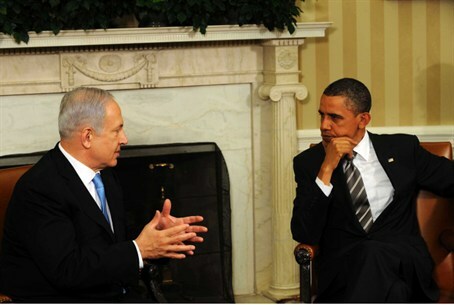 The poll was released days ahead of Obama’s visit to Israel, the PA and Jordan, his first to the region as president. On Thursday, Obama said in an interview with Israel’s Channel 2 News that his trip is meant to "listen" to both sides and hear their views on how to move forward after over two years without peace talks. Monday's White House meeting, which was not included on Obama's official diary, came four days after the U.S. leader held similar talks with representatives of the American Jewish community. During that meeting Obama signaled there would be no big Middle East peace initiative on the table when he arrives in Israel for his first visit as president.